Dharma Voices for Animals is a worldwide nonprofit organization dedicated to raising the awareness of animal suffering within the dharma community. It has recently come to our attention that during a Spirit Rock Community Dharma Leaders retreat at Garrison, New York, fish and steak were served during meals. This is very concerning, and it is our hope that Spirit Rock reconsider this policy. The Buddhist community is split on the question of whether eating animals is consistent with the teachings. In this letter we’ll talk about this issue, but we’ll also propose another inquiry; What arises when you consider this subject? We believe that our reaction to this topic is so strong that it informs our behavior as much as the teachings themselves. As Buddhists, it is incumbent upon us to be mindful of the conditioning and all the related influences that shape our conduct. We’ll end by addressing the specific policy at CDL retreats. As you know, there are two main branches of Buddhism – Theravada and Mahayana. 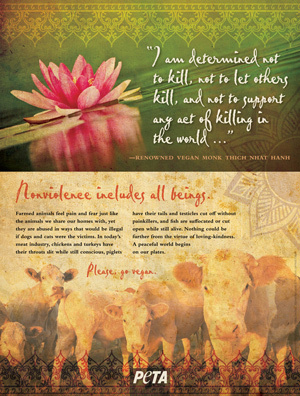 In both of these traditions, it is universally agreed that the First Precept calls for us to abstain from causing harm or killing, and this includes all sentient beings – human and nonhuman alike. Whatever one’s practice, compassion is the cornerstone of morality, and through it one recognizes that all beings suffer and want to be free from suffering. It is our task as Buddhists to refrain from harming animals in all aspects of our lives. For innumerable reasons, the Bodhisattva, whose nature is compassion, is not to eat any meat. them refrain from eating meat. If, Mahamati, meat is not eaten by anybody for any reason, there will be no destroyer of life. In Mahayana Buddhism, there is no dispute about this. Most monastics, even those who eat animals, accept that it is inconsistent with the teachings. Rather than defend or justify it, they readily acknowledge the unwholesome nature of their actions and accept responsibility for the karmic consequences. When it is not seen, not heard, and not suspected [that the living being has been slaughtered for oneself]. I say that meat may be eaten in these three instances. To understand this passage, it needs to be put it in historical context. During the time of the Buddha, and even today, monks were dependent on what was given to them in their almsrounds. If monks were to start refusing food, it might create political and logistical problems, causing an imbalance in the traditional lay-monastic symbiosis. In formulating this policy, the Buddha settled on the middle way, allowing monks to eat leftovers, since no additional animals would be harmed, but prohibiting them from eating meat if the animal was killed for them. The key principle was that in eating meat, the monk should not cause additional suffering. For those who invoke the three purities today, the same consideration applies. When you buy meat at the store or a restaurant, are you contributing to the killing and suffering of an animal? We believe that the conclusion is inescapable. Whether it’s the mass genocide of factory farming or the somewhat less devastating but still inhumane, unnatural and lethal conditions of local organic farms, animals are killed and mistreated, and when we eat meat and other animal products we are complicit in their suffering. In the United States alone, over 10 billion land animals and countless aquatic animals a year are killed for food. Every time we eat an animal, we are perpetuating this system. This question requires a serious and honest inquiry. If you conclude that when you eat a steak or fish or chicken you are contributing to the killing, the solution is to abstain from eating meat. Theravadans who eat animals sometimes frame it by saying that they are simply accepting what is given. But this does not follow from the three purities. On the contrary, the Buddha specifically instructs that one must consider whether the food offered is morally blameless. If it is not, one must reject it. Eating animals has moral – and karmic – implications which cannot be avoided by denying or abrogating one’s personal responsibility. Our relationship to food is one of our most intimate bonds. This is true for everyone. It’s no surprise that the subject evokes such strong emotions. But what is most surprising to us – and, to be frank, disappointing and frustrating – is the number of people, including serious practitioners, who choose to not even consider the subject. They reject the proposition that eating animals might be inconsistent with the teachings outright, almost reflexively. As Buddhists, we are taught to not turn away from uncomfortable situations but instead to face them head-on. The subject of eating animals evokes two of the strongest emotions, which also happen to be two of the three unwholesome roots – desire and aversion. We eat meat because we crave it. When we choose to not consider this we are often acting out of fear, worried that if we do examine it we may end up renouncing something to which we’re extremely attached. But these are not reasons to shy away from this inquiry. They are reasons to engage in it. In the end, Buddhist morality, while profound, is also quite simple. In every action, we can act out of desire or out of generosity. We can act out of fear or out of compassion. We can act out of cruelty or out of kindness. When you eat meat, what is your motivation? It may be that after a serious inquiry you decide eating animals is consistent with the dharma and are satisfied that your decision is not being subtly influenced by your conditioning or the arising of unwholesome factors. Or you may decide that eating animals is not in keeping with the teachings but that you’ll keep doing it anyway. That’s certainly honest. Our hope, of course, is that compassion, generosity and kindness will lead you to a commitment to abstain from eating animals and animal products. All we can do is encourage you to make an honest inquiry into this important question – one that acknowledges your true intentions. The rest is up to you. The policy at Spirit Rock’s main center is to serve only vegetarian food. While the reason for this is not stated anywhere, it probably derives from something a senior teacher once said. It’s done to meet the lowest common denominator. This is an acknowledgment that many practitioners are vegetarian and would find being in a meat-eating environment not conducive to the practice. It’s not clear why this same policy is not applied during CDL retreats. Our understanding is that the reason meat was served at this retreat was that since meat eating is part of some people’s culture, allowing it would be inclusive and add to the diversity of the group. We appreciate the sentiment behind this, but respecting other traditions is very different from incorporating them into our Buddhist practices. The most important consideration is staying true to our own values and aspirations, those of living lives of compassion and remaining true to the teachings of the Buddha. We strongly encourage Spirit Rock to reconsider this policy. We are happy to report that we heard back from Spirit Rock that moving forward only vegetarian food will be served at CDL (Community Dharma Leader) retreats.